The interior design of the Japanese bedroom decor is a kind of philosophy, proximity to nature and self-knowledge. That's why the Japanese avoid excesses in the design of their homes, the pretentiousness of the situation and the use of artificial materials, and the design of the premises is based on the ideas of minimalism, with the help of special strokes and accents, avoiding their extremes-excessive simplicity and asceticism. One of the concepts of Japanese philosophy is the proximity to nature. This is especially important for a bedroom where a person spends a lot of time, rests, relaxes. 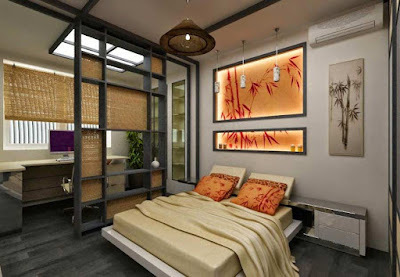 For finishing the bedroom, only natural building materials are used, it is furnished with furniture made of wood, decorated with natural textiles. 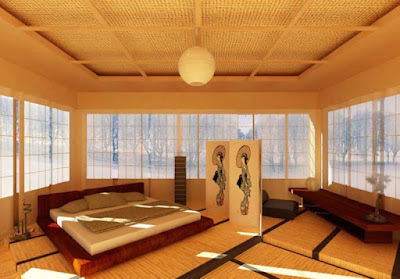 Japanese interior is fundamentally different from other oriental designs. These are not Arab countries with their bright colors, carpets, and fabrics. The Japanese avoid many details, striving for practicality and freedom in space. The fewer things and furniture, the less fuss, says Japanese philosophy. 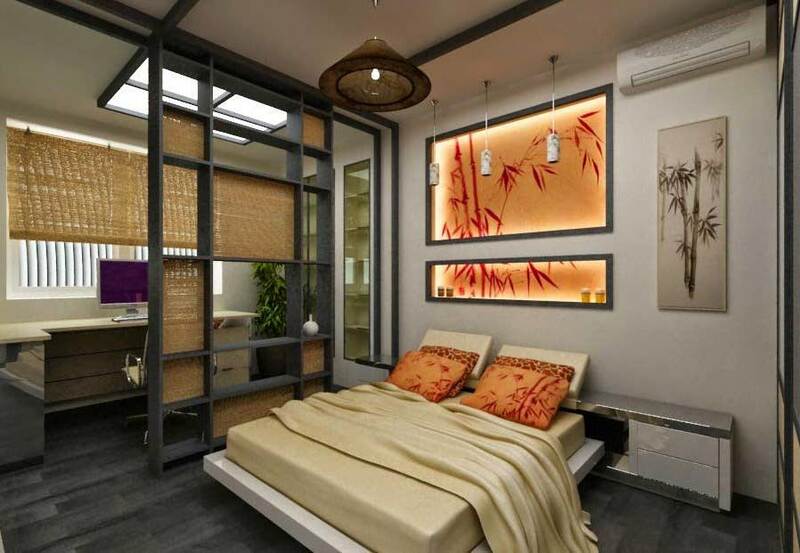 Restraint and simplicity of interiors contribute to the development of spiritual harmony and will. Japanese dwellings were formed under the influence of the rather harsh natural conditions of the country, where only one-third of the territory is suitable for living. 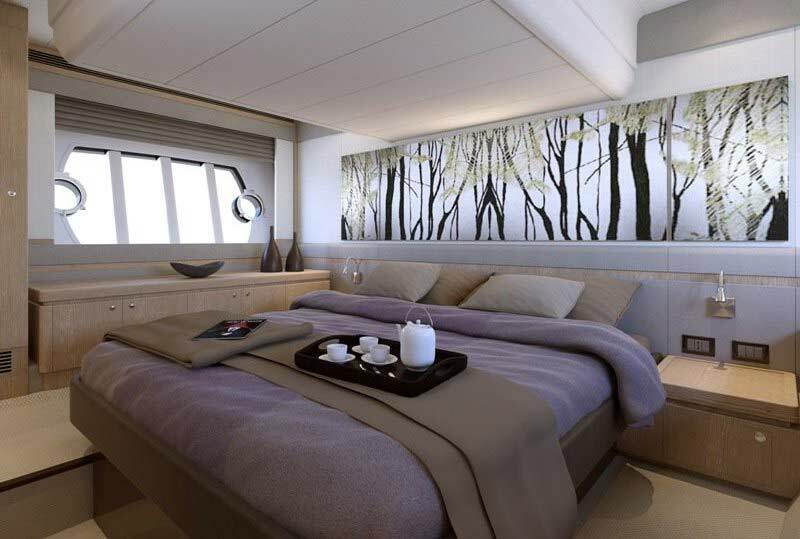 Regular natural disasters (typhoons, tsunamis) did not allow creating complex interiors. On the contrary - easily collapsible houses more than once saved lives the many people. 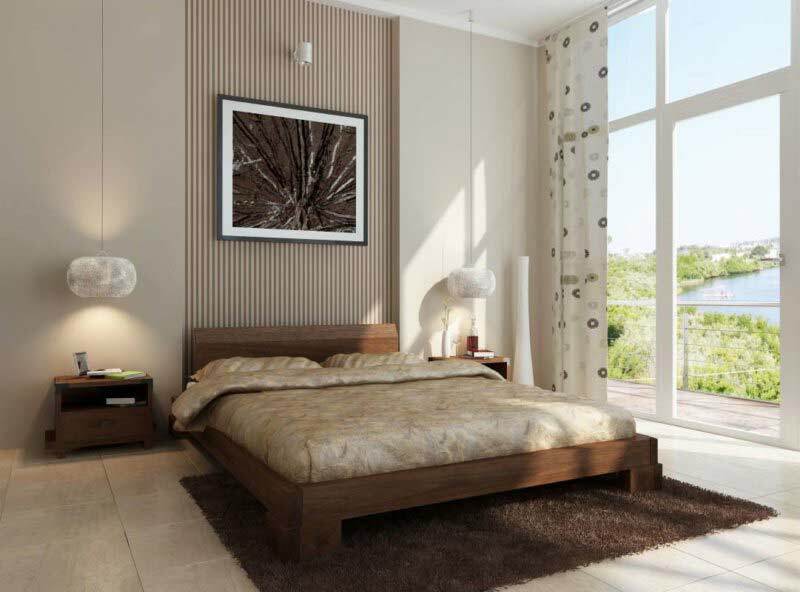 Minimalism, lack, oversaturation of space help to leave cares outside the home or a particular room. 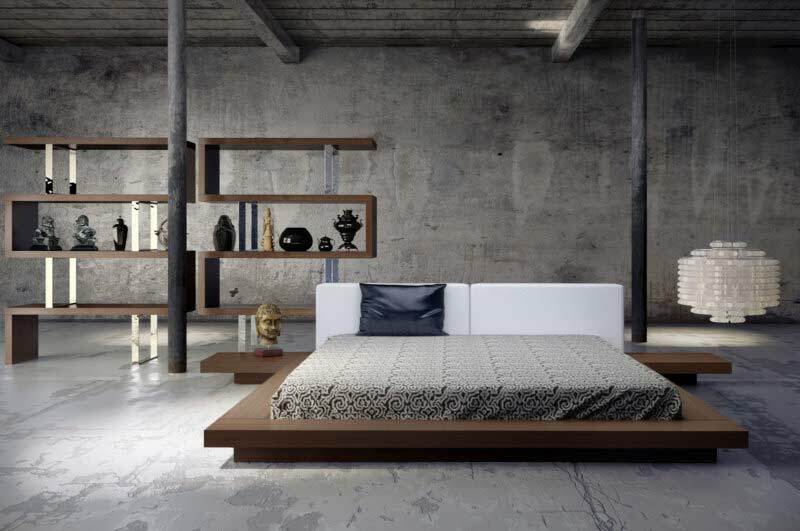 The naturalness of materials that help to emphasize affinity with nature. Rationality. The functionality of the space implies the convenience of simple furniture, built-in sliding cabinets and other items that are convenient for use. 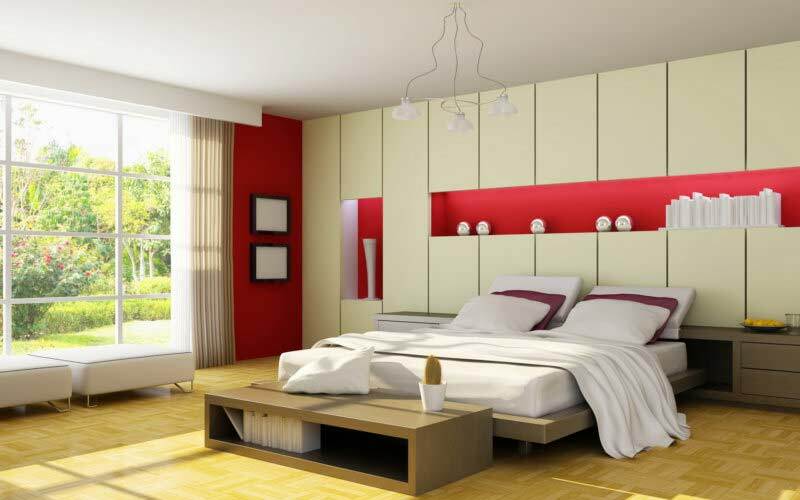 First of all, you need to choose the colors in which the Japanese bedroom will be made. 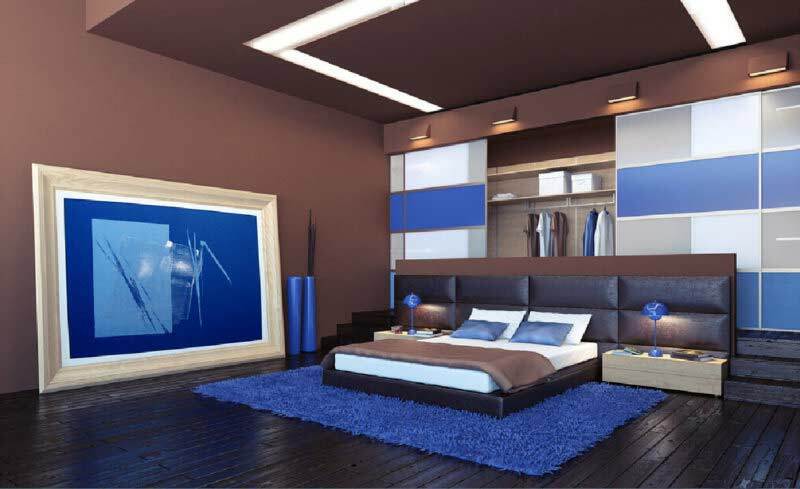 Basics are most often chosen from beige, white, cream, gray and black colors. They are supplemented by different shades. A lot of bright screaming colors should be avoided, but you can make an accent quite. 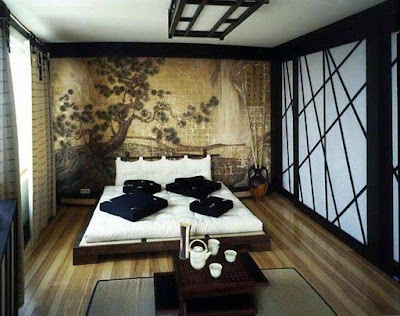 As in the Japanese tradition, the walls in the bedrooms are replaced by light partitions (shoji), made of light wooden frame and paper, in a bedroom decorated in this Asian style, you should use either light wallpaper or wood panels that look like traditional screens. These materials can be replaced with a special paint, in which a stencil pattern can be applied. Another option can be a natural fabric. The latter method is considered the most expensive, but also the most comfortable. In the Japanese tradition, it is believed that the ceiling should be rectangular. Usually, the ceilings are made by the beam method. The beams divide the pre-painted surface into segments of regular shape. Sometimes after fixing the beams between them, pull paper or cloth. You can make the ceiling stretch, but natural materials more harmoniously fit into the interior. 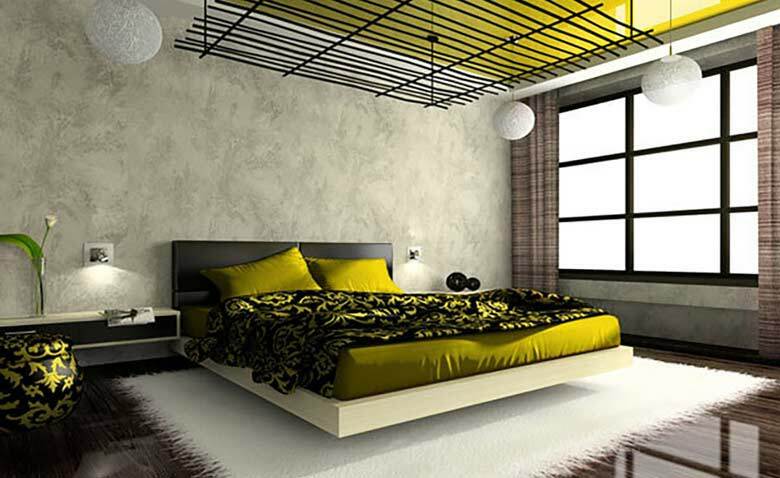 It is desirable to make a ceiling in the color of the walls, but harmonious differences are allowed that fit into the overall color scheme. 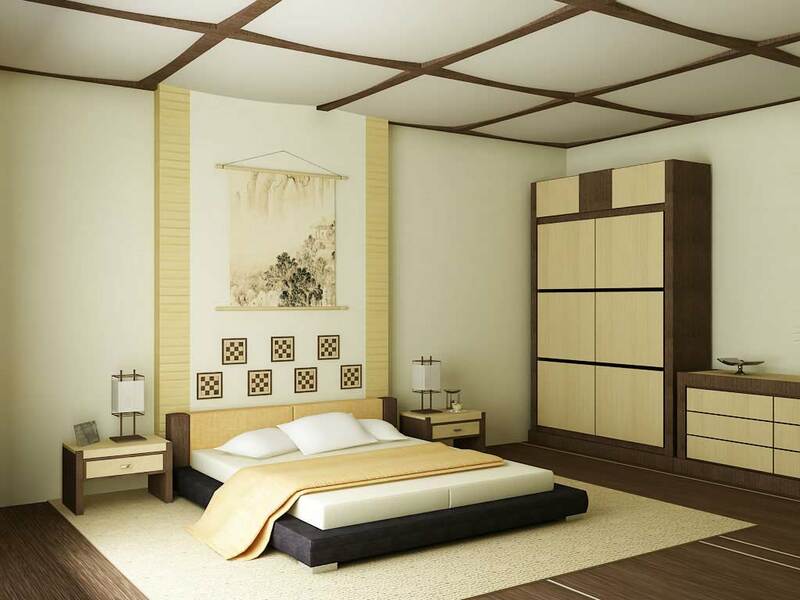 It is believed that the larger the section on which the ceiling is divided, the more spacious the bedroom seems. 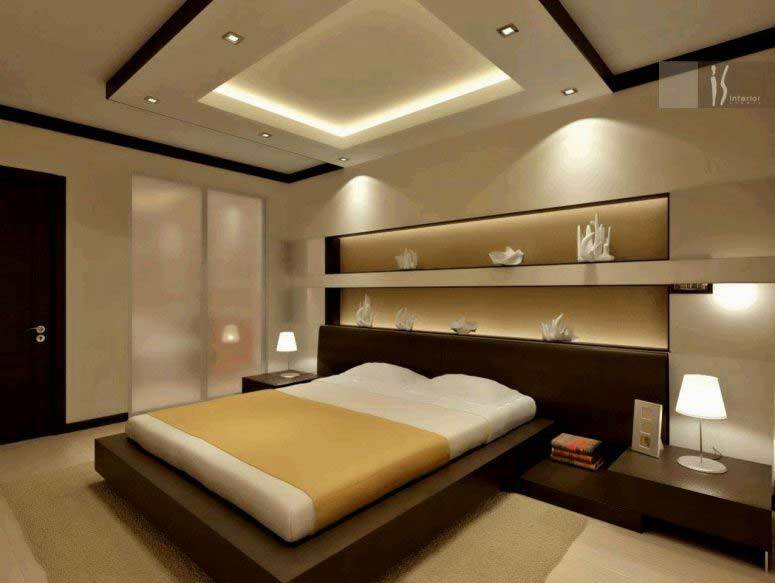 Beams must be made of materials that contrast the very ceiling. In the Japanese houses, very much attention is paid to the outdoor coating, as it is customary to walk barefoot on the premises. This applies to the Japanese style bedroom to the greatest extent. Usually, the wooden floor is covered with tatami. In modern life, such a coating can wear out. It can be replaced with a carpet: either monophonic or with a pattern made in Asian style. 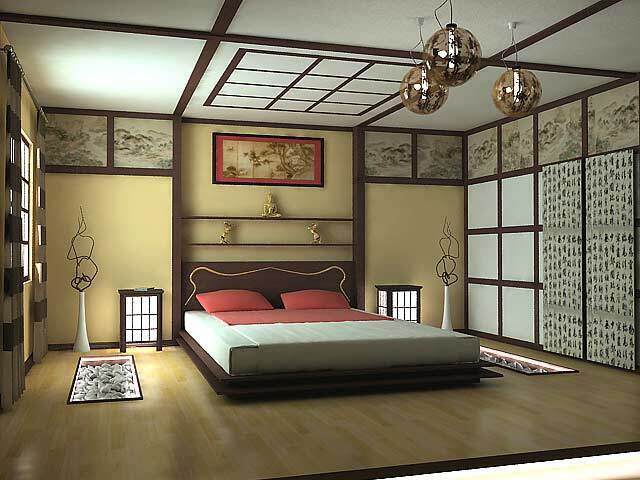 In a bedroom decorated in oriental style, there should be no sharp light. He fills the whole room, there are many, but he must be distracted. 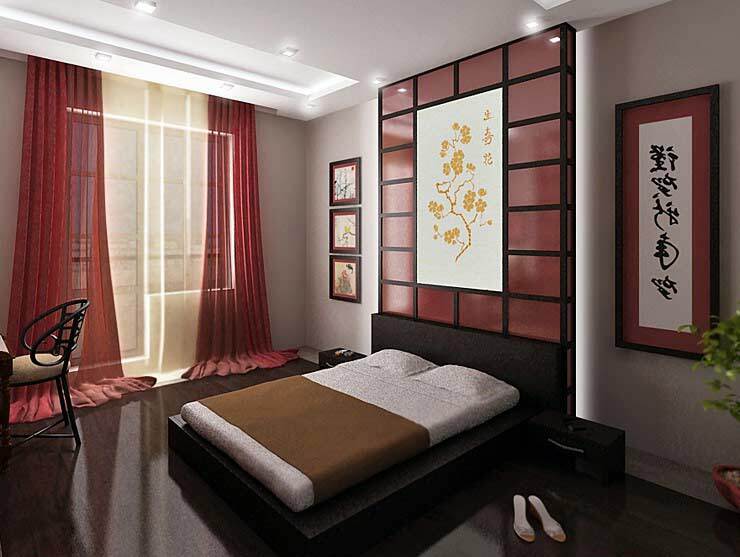 To create this effect, you can use paper lampshades or frosted glass. 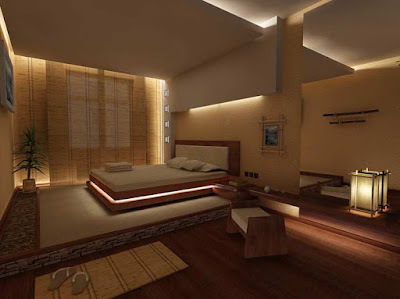 The boundaries of light and shadow with such lamps are not very obvious, and the light itself fills the entire bedroom. 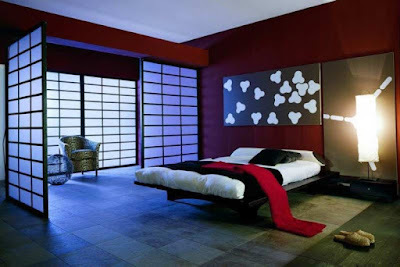 The Japanese practically do not use nightlights and table lamps to avoid sharp shadows. Daylight floods the room, and at night includes ceiling chandeliers. The light sources themselves are made of natural materials (wood, paper, rarely - glass) black and white. Materials of other shades are used occasionally. Chandeliers should be geometrically regular shape - round or rectangular, as required by the minimalism of the interior. 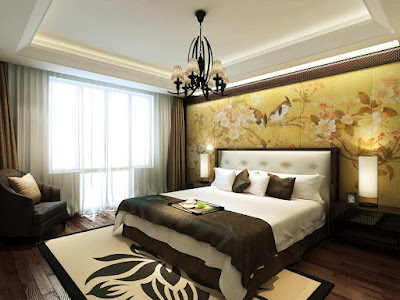 To make the room more oriental in color instead of curtains on the windows it is necessary to use special panel blinds made of natural fabrics - monochrome or with a thematic pattern. The doors in the Japanese bedroom are made a sliding, which significantly increases the living space of the room. 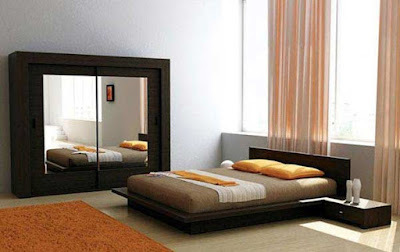 The main subject in any bedroom, no matter what style it is, is a bed. 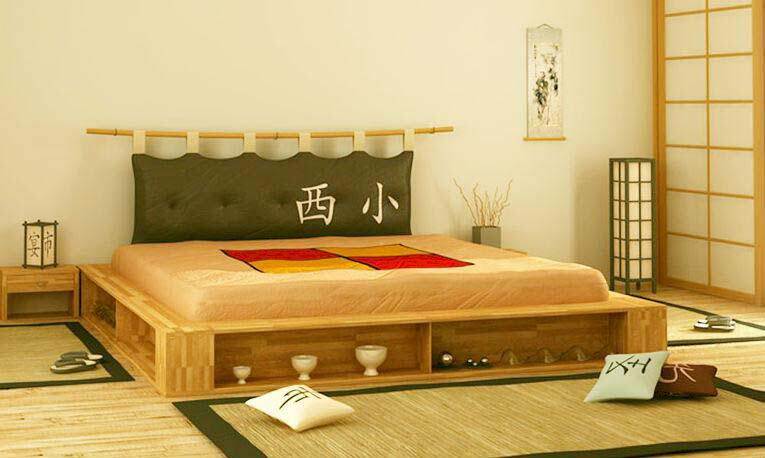 If the bedroom is made in the Japanese style, then this piece of furniture should resemble the futon - rectangular mattress, which is preferred by the Japanese. Legs either should not be at all, or they should be low. There may be a special podium for the bed. It is not forbidden to use small bedside tables. Instead of cumbersome and space-consuming cabinets, the Japanese use wall niches that are covered with panels - in the manner of a wardrobe. It is possible to use small shelves for storing souvenirs. 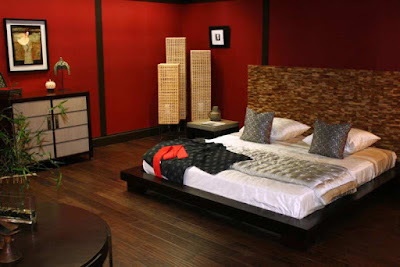 A small table for a tea ceremony will also transform your room. 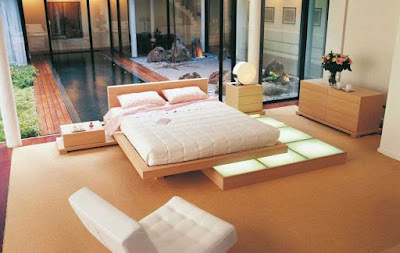 An irreplaceable attribute in the Japanese bedroom furniture is the screen. It can be depicted animals and plants made in the national Japanese style decor. Laconism and expressiveness - this is the basis for decorating the eastern interior. The main task - using different accessories, do not overload the space. Large fans or "samurai" swords will look good on the walls. 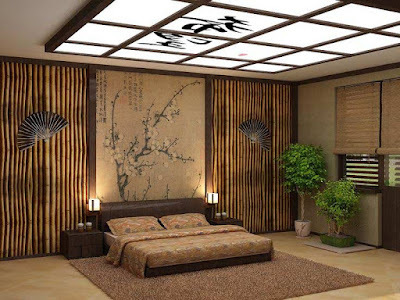 It is possible to use paintings made in Japanese style decor. 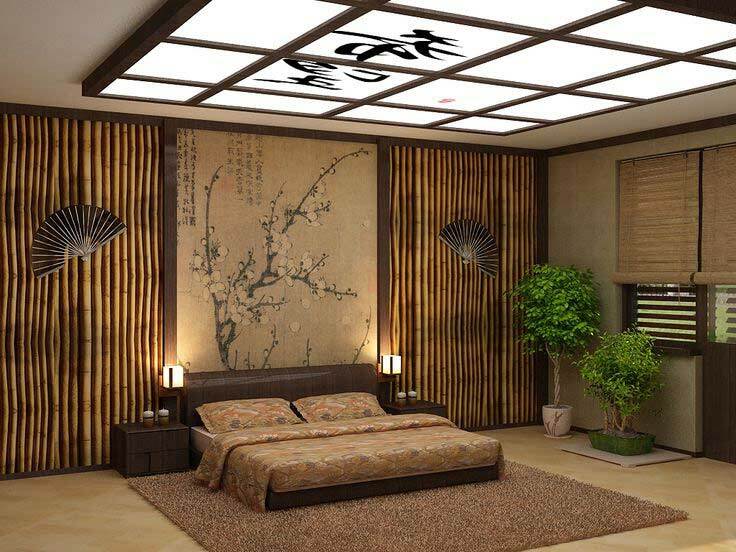 Traditional sakura can also decorate the walls of your bedroom. On the shelves you can put figurines and dolls, dressed in a traditional kimono. The hieroglyphs applied to various objects will fit well. 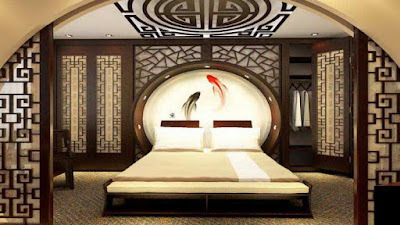 If you are going to decorate your bedroom with a symbol, you should find out its meaning. A small fountain of natural materials will add balance and harmony to the bedroom. The same effect can be achieved using a bonsai plant or a vase with a beautifully composed ikebana. Scented candles with soothing scents will translate your interior to a new level and add comfort. Decorative elements for immersion in the atmosphere of such a mysterious place is a great variety. The main thing is to concentrate on finding equilibrium and not overload the room with too many things. Trying to design a room (and especially a bedroom) in Japanese style with your own, you immerse yourself in the incredible world of a rather difficult Eastern culture, in which balance and minimalism are very important. 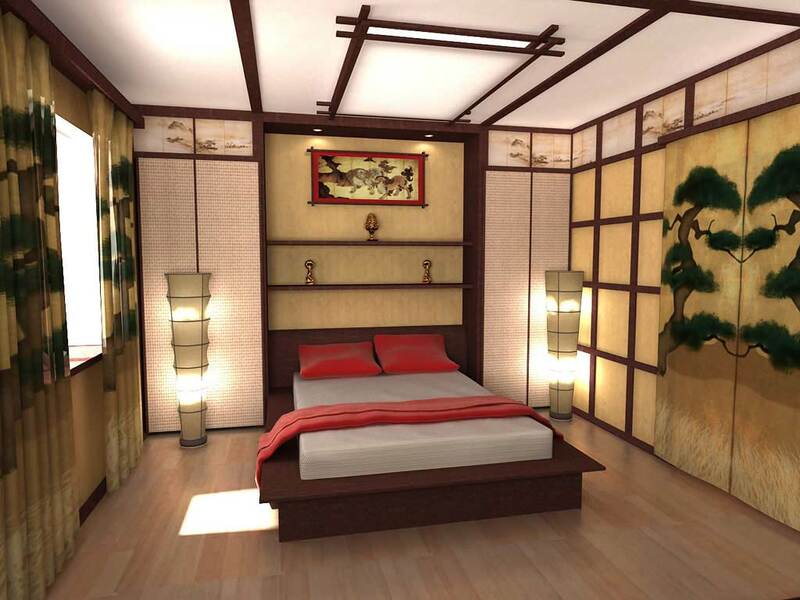 The most important thing is to remember the following: the more modest this bedroom looks, the less distracting elements in it, the more it corresponds to the spirit of Japan. Such a bedroom will be a comfortable place not only for sleep but also for self-development, self-education. Perhaps it will be difficult to create a Japanese bedroom furniture interior that meets all the requirements. If possible - such a room will be the place where it will be pleasant to relax after all the "storms" of the working day. If you are not sure that you can do everything yourself, contact a specialist. 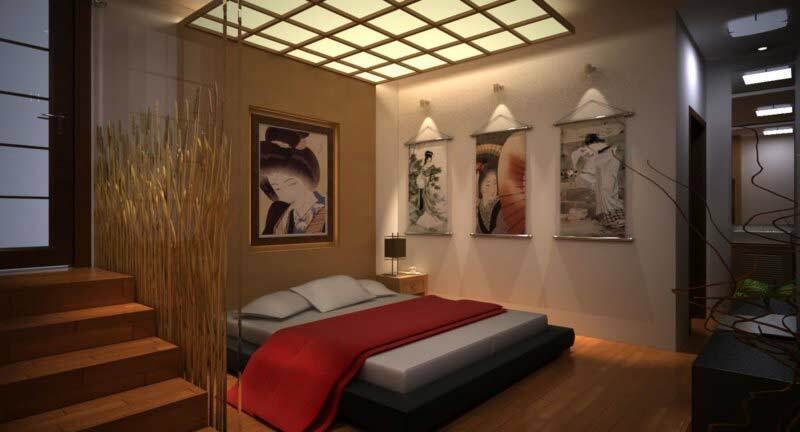 Great importance in the Japanese bedroom decor is given to lighting, it should not be bright and beat in the eye. Soft glow, reminiscent of the lunar, the play of light and shadow, halftones are relaxing, allow you to plunge into relaxation, relieve stress and nervousness. 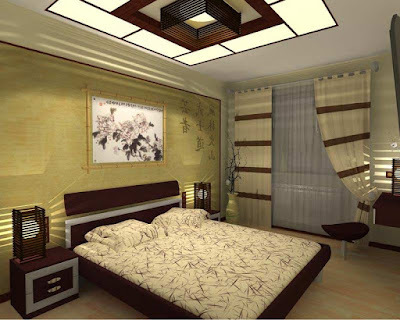 Lampshades for chandeliers and lamps are made of parchment, wood, natural silk, glass, and porcelain are allowed. 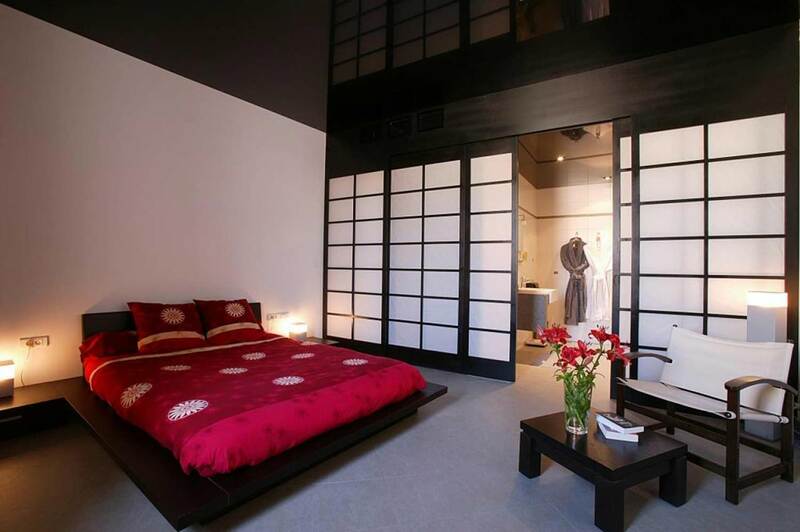 The design of any Japanese bedroom looks unfinished without curtains. Perfect fit in the Japanese interior light curtains made of natural cotton or silk in the form of monochrome fabric bands, without lush folds, fringe, and other "luxurious excesses." All things in the Japanese style bedroom are laconic and expressive, so accessories must be unique and carefully chosen. In a niche or on a shelf, you can arrange several traditional figures and statuettes, and decorate the walls with calligraphic scrolls, engravings, paintings in the Japanese style bedroom art masters or painting in the form of a sakura branch. 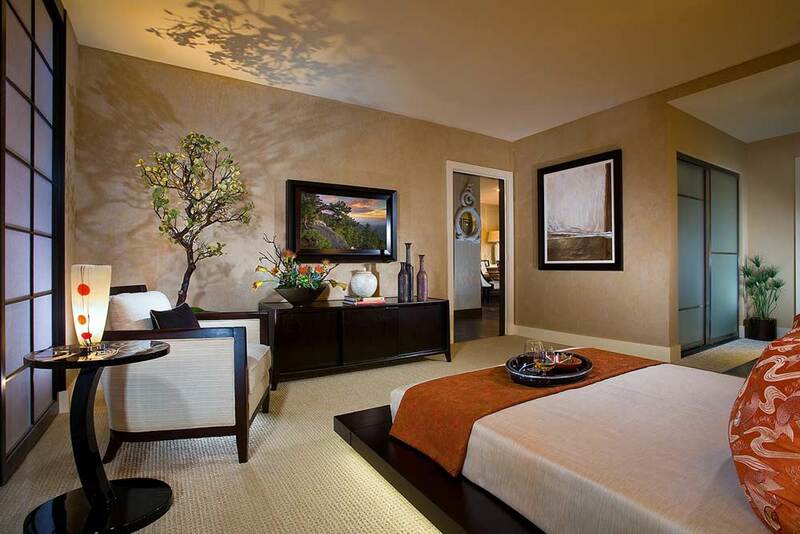 As for indoor plants and flowers, the Japanese bedroom decor can be decorated with a bonsai - a dwarf tree planted in a low pot. The ability to grow bonsai is the national pride of the Japanese. In the vase, you can put a bouquet, selected in a special manner - Ikebana. The Japanese make it both from live, and from dried flowers. 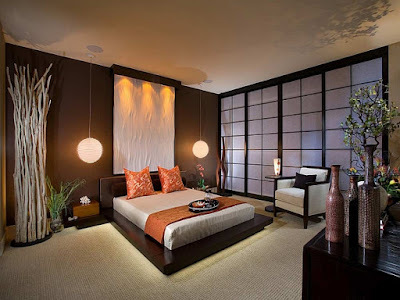 White porcelain aromatic lamps with candles burning in them, elegant plates in the form of flower petals and other decorations will give the Japanese bedroom furniture flavor and at the same time fill, but do not overload the space. 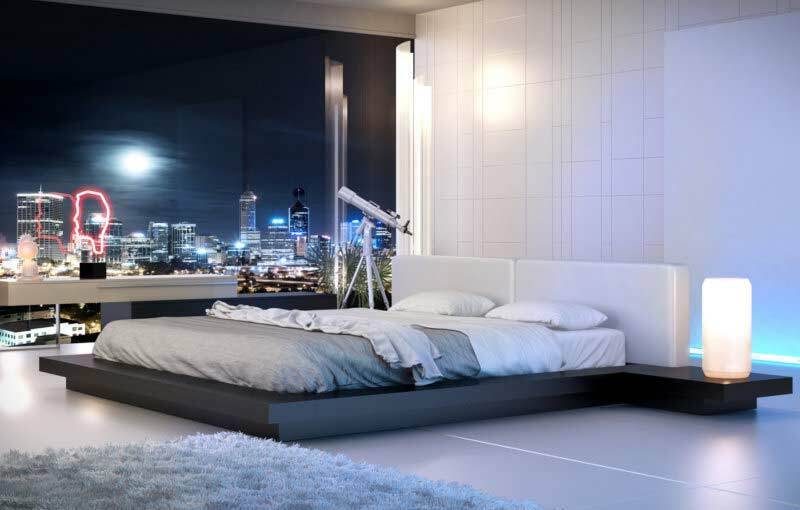 Japanese wisdom says that harmony in life brings contemplation of flowing water, so a mini-waterfall made of natural stone will be very handy in the bedroom.